Predicting how today’s technology will develop is interesting and it’s useful to think about how we can plan ahead. However, it’s all very well discussing ‘the future’, but technology is for the now and needs to be integrated carefully into our present environment. So let’s not get over excited about what technology will bring in years to come, but first focus on how to make use of the fantastic range of hospitality technology currently available. As customer dynamics change, so too do expectations, and the hospitality environment needs to adapt accordingly to suit evolving consumer needs. EPOS systems and technology, carefully utilised, are some of the greatest tools available to facilitate businesses staying ahead of these changes. Today’s customers expect more of what they want, when they want it. Choices are vast, the pace of living is fast; now more than ever it’s important to add value and to build loyalty with those customers. Consistently delivering the service that people want is the best (and most traditional!) way in which to do this. The next generation (Millennials and Snowflakes) are coming into the purchasing cycle and they are looking to purchase in a different way. Self service point of sale technology addresses this new dynamic of shopping and the desire to browse and purchase in ones’ own time, and it creates truly personalised service. 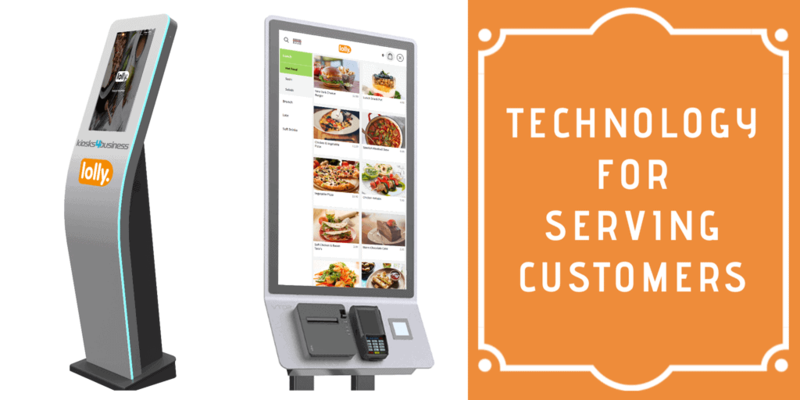 Self-serve hospitality EPOS systems also enable the hospitality provider to reorganise their staff and redirect time and resources to other areas of their business – thus improving their offering and keeping up with increased footfall. Short-term, most restaurants will be looking to deliver a mixed customer service offering. Order and collect, fast food EPOS systems and traditional cashiers are all important, as most environments are not quite ready to be completely cashless and self-serve. Slowly integrating these offerings into a business will not only allow some customers to evolve and adapt, it will also facilitate the transition into using technology to order and pay. Investing carefully in technology as it becomes available allows smaller businesses to keep up with a changing customer service environment and not rush into purchasing at the last minute when it becomes essential. Hurried decisions driven by last-minute necessity often result in paying over the odds for products and services that are not the best fit for a business. Affordabilility is a key issue for many, therefore planning ahead and looking to make careful investments in flexible, well-integrated technology is crucial. Seamless and simple is what technology should be delivering when it comes to customer service. The payment world is shifting quickly towards this. There is much talk of our ‘cashless’ society. Whilst currently this might mean card and phone payments, soon we will be looking at a whole new system utilising biometrics purchasing. This technology will allow for faster, more seamless interaction and payments. As the new norm, customers may turn away from businesses who cannot offer this. Smaller businesses, for whom it is hard to keep up with new payment technology, can struggle to maintain their client base. If we want to continue to champion the entire landscape in the hospitality sector, we need to ensure that affordable payment solutions are available and accessible for all businesses. It seems that not a week goes by without big security breaches and data being hacked. Customers are now more and more aware, and cautious of the risks associated with sharing their information. Restaurants, cafe’s and bars of all sizes have a duty to protect their clients, and their data. Selecting the right technology provider will also help to protect you and your business. In order to ensure customers are engaged, but not deterred, hospitality providers have to create a careful balance between consistent, yet non-intrusive, communication. Whilst there are so many great ways to communicate through messaging and social media, increasing numbers of us are becoming wary of sharing our data. By offering customers an interaction point they have chosen to link with loyalty schemes, they are able to instigate contact, allowing businesses to communicate in a less intrusive manner. It softens the ‘in-your-face’ up-sell, and makes it more personal. At the end of the day, the main purpose when it comes to technology should always be centred around encouraging better customer service and engagement. So take a careful look at what your customers are looking for now, then consider how you can take advantage of the huge range of hospitality technology offerings to lead you and your business into the future.